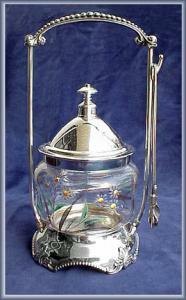 This is a great American Victorian silverplate pickle castor. The unusual enameled clear insert is in excellent condition with no chips or cracks. The resilvered frame is 9" in height. The manufacturer's mark is Poole #165.